Interagency work of the Brazilian Armed Forces and the Military Fire Brigade. The chemical, biological, radiological and nuclear defense sector in Brazil has received great attention in recent years. The rise of CBRN, to a level of great importance, was due to events that have occurred within the last decade. Brazil hosting the Pan-American Games, the 2014 World Cup and the 2016 Olympic Games in Rio brought many heads of state and other VIPs to the country at one time. 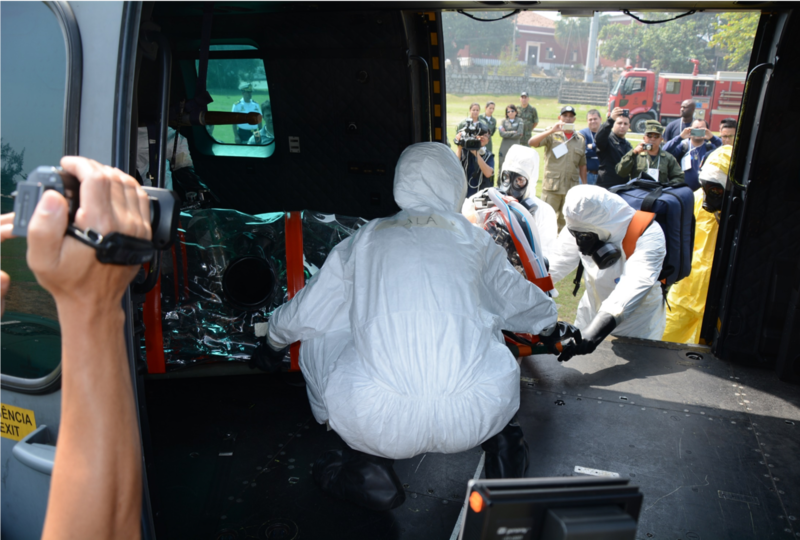 This not only tested the capacities, but also enhanced the knowledge of the Brazilian Armed Forces along with many other specialized agencies, ministries, first responders and healthcare professionals, on CBRN defense. Preparation for simulated transport of injured by aeromedical evacuation. 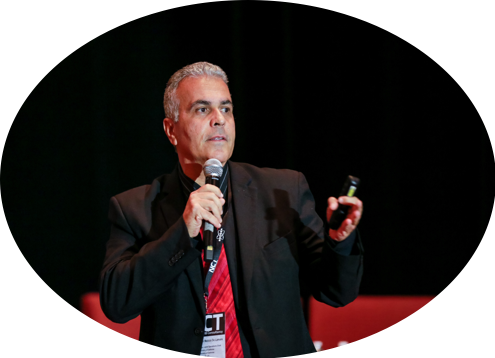 The experience gained through hosting so many high-visibility events (HVEs) brought a great amount of international recognition to Brazil. For example, the Organization for the Prohibition of Chemical Weapons (OPCW) sent a delegation to Brazil, as a signatory to the Chemical Weapons Convention and as a partner for the development of activities to promote international security with regard to the control of chemical weapons, aiding states parties, and promoting cooperation, in order to encourage the pacific use of sensitive goods such as chemicals. To reach this objective, in December 2016, the Minister of Defense of Brazil created, together with other national organizations such as the Ministry of Foreign Affairs, the Regional Center for Assistance and Protection Against Chemical Weapons (CAPAQ). The center is in charge of organizing, planning and coordinating training exercises, laboratory reports, inspections and other activities required within the scope of the objectives laid out for Brazil. The Regional Center also takes existing structures between the Brazilian Army, Navy and Air Force into account as they have, and still do, act together along with other government agencies for the purpose of optimizing procedures. These are also considered, as these three branches have and continue to cooperate within existing international conventions, in response to internal situations in the realm of civil defense work such as in the face of national disasters, incidents involving hazardous chemicals or even in the planning of the transport of highly sensitive biological components. Simulation of verification of clandestine laboratory of toxic production. The creation of CAPAQ lends Brazil respect and admiration for constant action the search for a peaceful international environment, free of chemical weapons. This creation is of great importance, for it opened a great number of opportunities. In 2017, for example, the regional exercise on assistance and protection for state parties of Latin America and the Caribbean occurred. This included five days of intense activities, with thirty-two institutions represented. Members of the armed forces, security organizations and first responder units of various institutions of the following countries took part in the exercises: Argentina, Barbados, Chile, Colombia, Costa Rica, Cuba, Dominican Republic, Ecuador, Guatemala, Mexico, Nicaragua, Panama, Paraguay, Peru, Uruguay and Venezuela. They came to Brazil for an exchange of experiences and an effective learning environment that brings safety, professionalism and operational promptitude to our region. Practices and techniques were improved and tested again, ensuring that more and more members of the forces responsible for the safety of our countries are suited for facing critical situations, which require a high level of knowledge and expertise. The expertise which has been obtained through these events brings about another important lesson. 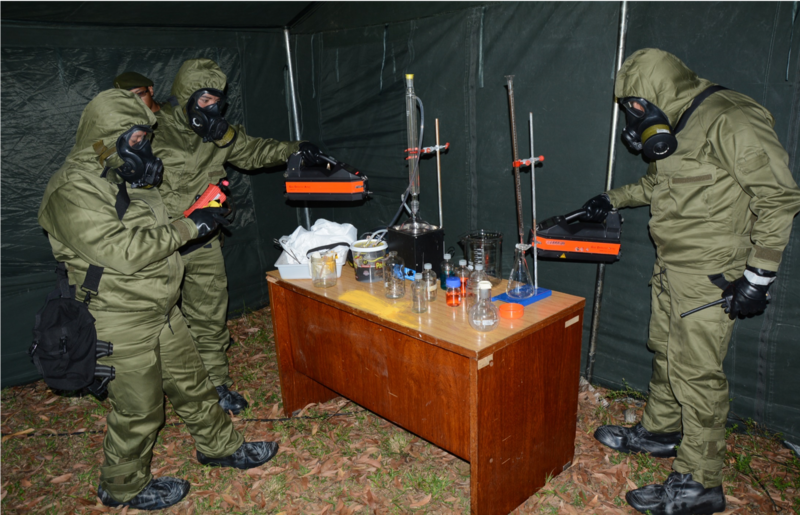 In facing any threat, such as that of terrorist attacks or CBRN incidents, the formula to success includes exhaustive training on response and interoperability as well as knowledge sharing between members of the CBRNe community. In the specific case of the OPCW, the connection of Brazilian national authorities with the rest of the world allows the development of various activities, which promote international cooperation with regards to the control of chemical weapons. This cooperation expands the optimization of procedures and success of international conventions. The work of the Brazilian Ministry of Defense, despite the creation of CAPAQ, is not restricted by this specific letter of CBRN defense. The same course of action was taken in regard to the convention on the prohibition of biological weapons. Similarly, to the work stemming from the CWC, the worked pursued here allows for the control of biological inputs, which can also be used criminally for the construction of weapons of mass destruction that bring panic, terror and pain to citizens of countries in every corner of the Earth. These experiences may also be applied to the fields of nuclear and radiological defense, in respect of the requirements of the international organizations that give attention to these subjects, whether in the field of control or in the preparation of first responders. After the success of the exercises led by Brazil in 2017, the OPCW requested that Brazil hold further intensive exercises involving the armed forces of Portuguese speaking nations. The exercises included courses in the identification, decontamination and monitoring of chemical agents. Members of organizations from Portugal, Angola, Cape Verde, São Tomé, Príncipe and even from Venezuela, who attempt to dispose of speaking Portuguese, took the opportunity to improve their knowledge and response capabilities. In addition, there was also the request from the OPCW for a specific exercise focusing on the medical side of responding to incidents / accidents involving chemical agents, in order to analyze the possibility of the course being provided to the countries in the southern-most region of South America.In conclusion, Brazil is a leading country committed to international security with regard to the mitigation of the threat of the use of weapons of mass destruction, specifically CBRNe threats. Simulation of accident involving vehicle of transportation of toxic products and buses of people transport. Col. Chamon De Lamare is currently a CBRN Advisor to the Joint Operations Chief in the Ministry of Defense of Brazil. Before becoming an advisor to the Joint Operations Chief, Col. De Lamare headed the CBRN Section of the Ministry of Defense. His outstanding military career includes the positions of Commander of the 26th Campaign Artillery Group and Advisor to the Ministry of Defense in the Department of International Affairs. In 2014, he managed the implementation of the Chemical, Biological, Radiological and Nuclear Defense System of the Brazilian Army. Then from 2015 to 2016 he was the Military Adviser on Combating Terrorism in CBRN at major events, in the special advisory group of the Ministry of Defense to plan these activities, and promote various interagency trainings and other activities with the different bodies involved in the preparation and coordination, such as the police and other ministries.